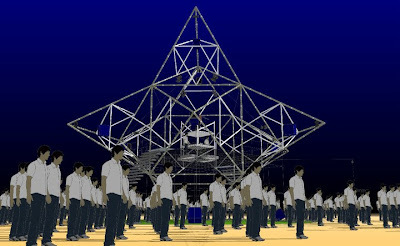 This is a open air - free standing - 720 degree - nightclub unit as a trinity of SOUND/Lights/Architecture. It's not 5.1ch or any surround audio system. I used to have a frustration that I cannot move my head and body with such great audio system. Because it need fix the position to get the result of the sound quality. All most of the existing system is based on a stable condition, in cinema, live, living room and studio. 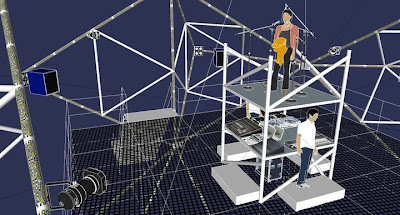 And it's well developed in the "Sound Art/New Media" industry though, still for an installation way, not for a NIGHTCLUB ENVIRONMENT and SOUND. 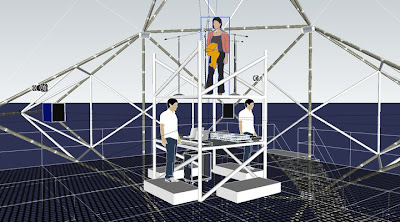 The focus point of this system is 'you can dance with a dancing 720 degree sound', in the field without wall even the floor meshed surface for passing the sound from the top and bottom. 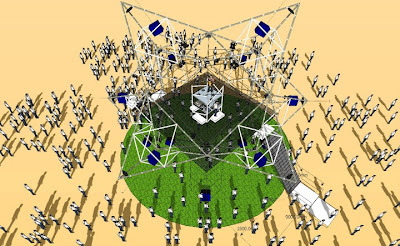 The Stage/Dance floor itself is not so big 9m x 9m as like a small night club, but it's lifted up 4m hight and about 30m x 30m area on the ground is also very effective sound field as a dance garden. The experience of that is up to the place where you can dance, or even chilled on the green grass. Basically it can be activated by just normal DJ stereo source. 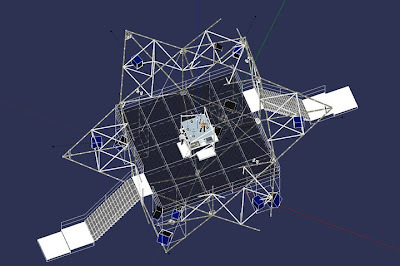 The source 'Left+Right' will be divided 3 as 'High/Mid/Low', they 6 sources will be chased by several speeds on 10 speakers in 720 degree (360 degree + 360 degree). And lighting are linked with them. DJ can control them him/herself too, if they want. And, Vocal or any acrostic instrument can overlap to sing and play in the center of the stage with 5 direction microphones on live. If a musician can turn the head, the sound direction also changed naturally. This is a human interactive interface as primitive way which I like. So sound/lighting operation and DJ/Vocal/musicians are all together in the center of the space. 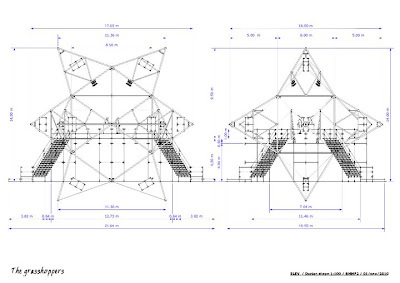 The shape is made by 6m standard scaffolding steel pipes mainly. 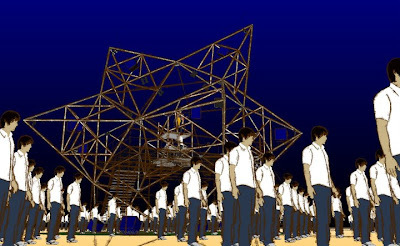 And the stage and dance area lifted 4.5m up from ground will be made just the other readymade scaffolding system attached with steel mesh floor that can pass through the sound from and to the ground and floor. 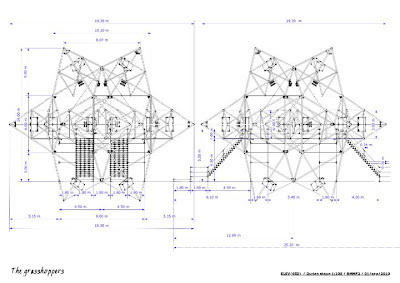 Flad 'god' lights, 12 strobes and just 4 LED par will be set on the each corner of the flame where speakers be set. AONAMI IS AN ELECTRONIC MUSICIAN FROM TOKYO WHO PRODUCES ALTERNATIVE LO-TECH/LO-BIT MUSIC WITH REMODELED OLD SKOOL NINTENDO GAMEBOY AND SOME COOL GADGET. 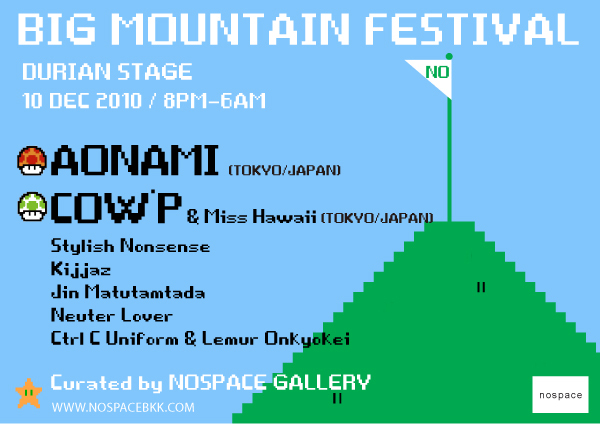 AONAMI HAS BEEN ACTIVELY TOURING ACROSS EUROPE, ASIA, AND THE US, INCLUDING APPEARANCES AT THE BLIP FESTIVAL (NYC/USA), SXSW (TEXAS/USA), FORMOZ FESTIVAL (TAIPEI/TAIWAN), P.art.y (SEOUL/KOREA), TAITUNG MUSIC FESTIVAL (TAITUNG/TAIWAN), LANDMARK/KUNSTAHALL (BERGEN/NORWAY), ITALIANS DO IT BETTER/arciblob (MILANO/ITALY), MICROBOPARTY (BOLOGNA/ITALY), MICRODISKO (STOCKHOLM/SWEDEN). COW’P IS A CHIPTUNE ARTIST, A TROMBONE PLAYER BY DAY AND GAME BOY ROCKER BY NIGHT. HIS GAME BOY SOFTWARE OF CHOICE IS NANOLOOP. COW’P HAS PERFORMED AT THE BLIP FESTIVAL 2008 IN NYC. JIN IS A NEW, YOUNG AND OUTSTANDING EXPERIMENTAL MUSIC PERFORMER, SPECIALIST ON NOISE MUSIC. JIN COMPOSES HIS TRACK BY USING BOTH DIGITAL AND ANALOUGE NOISES FROM HIS INVENTED INSTRUMENTS, WHICH MADE BY TRAFFIC CONE FROM THE STREET, MEDICAL EQUIPMENT FROM HOSPITAL, BLACKBOARD AND CHALK FROM SCHOOL, PRINTER FROM OFFICE, TO THE DIGITAL MUSIC GEARS. NOSPACE RECOMMENDED!!! records, for example, Yai Monotone's "Heavenday Afternoon" album with Monotone Group, Singto Numchok. focusing on good music & high sound quality. Lemur Onkyokei is aka of Teerapat Parnmongkol . he is a composer multi-instrument and sound artist working in installation and interactive performance. He was one of founder of Sonic Scape Orchestra and Ctrl C Uniform, he has perform with SSO and Ctrl C Uniform many place in BKK Thailand. Teerapat has guitarist back up in many band in Thailand such as Madagascar 11 circle,Wave venue etc. Now he been roaming around Thailand to work with Madagascar 11 circle in 2010 he being make new thing a kind of sound of experimental. They are called Clrl C uniform from time to do music computer it uses keyboard shortcuts.And the music is wont to do music Demo I want to keep a number of people to listen our work. So I applied myspace.Has become an idea.All name the band Remove the word Clrl C and add the word Uniform.Without reason.Become to Clrl C uniform. 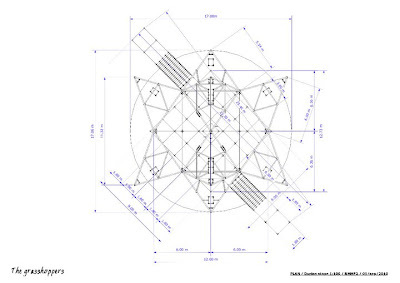 Project the out from Sonic Scape Orchestra is Model different from the show Sonic Sca.. Orches... Ctcl C uniform is the Experimental music, noise sound and sound mixing analog synthesizer.Presentation to Technology.Generation Technologies 80' recovery.Each show of Ctrl C Uniform.We find someting new. We are presentation All of work. "Not a musician, don't have any good music skill... I just know what I want and I do." Neuter Lover started her music scene as a Bedroom Studio artist, she delivers a blend of Ambient and Shoegaze music with sound of computer programming and noise Guitar. With her unique of vocal and music sounds, In 2005, Her demo was nominated for 15 finalists of FAT Awards 3 - 'Bedroom Artist of The Year' (by FAT Radio, FM 104.5). 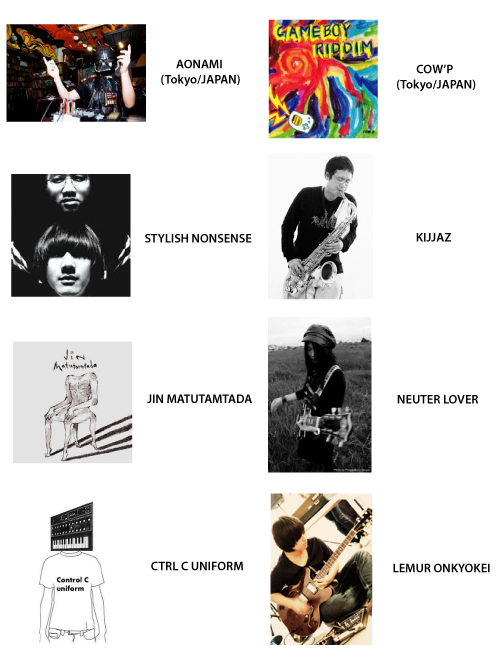 And the demo song 'Find' was published on DDT Magazine's compilation CD vol.4. Additionally, she was honored to be selected to perform live in Fete de la Music 2005, as the highest scorer of her self-produced 10 demoed songs. And as soon as she released her demos on the Internet, she was invited to be vocalist/songwriter of the duo band 'Acid Lily', founded by a japanese electronica artist. They produced music online and released the first EP on November 2005 with Spicy Disc records (thailand), then a self-released album in April 2006. The end of the band came on November 2006 and they won FAT Awards 5 for 'Bedroom Artist of The Year'. Now it's time for Neuter Lover to continue her own tunes! After passing out from many hard situations, 1st mini album 'I am Neuter Lover' released on April 27, 2010. It was a long journey of studio production since the year 2007, Neuter Lover produced her mini album with talented artists who understand her music, they created fantastic sound installation and additional arrangement. Then all the tracks were mixed down and mastered by Woody Pornpitaksuk, who was recognized at the 43rd Annual Grammy Awards for his work on the Historical Album: Louis Armstrong - The Complete Hot Five and Hot Seven Recordings. Then the beautiful sound of her music led Neuter Lover to win AVIMA 2010 (Asia Pacific VOICE Independent Music Awards) 3rd place (Bronze) in "Moody melancholic masterpiece" with the song 'Ha (Find)". Experience the 'I am Neuter Lover' mini album at major music stores in Thailand and online stores for worldwide.